UPDATED 1/26/2017: With respect to the creation date of the SHA's yellow light timing policy, we previously stated the policy was implemented in 2015, based on statements made to us by the Montgomery County Government. The SHA has informed us that their policy on setting a minimum yellow light time of 3.5 seconds was created in 2003, 12 years earlier than Montgomery County claimed. 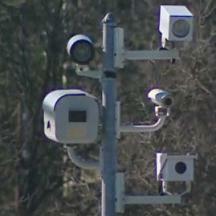 The Montgomery County Automated Traffic Enforcement Unit has temporarily turned off a red light camera located at Georgia Avenue at Seminary Road after it was revealed that the timing does not meet the current SHA yellow light timing standard, according to a report by WJLA. Concerns were first raised after a motorist discovered a ticket she received from the camera, a fraction of a second after the light changed, showed a yellow light time of "2.9s". The minimum yellow light timing permitted by ANY yellow light anywhere is 3 seconds. The yellow light in question claimed to have been timed at 3 seconds, according to the Montgomery County. Nevertheless both the Maryland Drivers Alliance and WJLA independently timed the light at slightly less than 3 seconds. 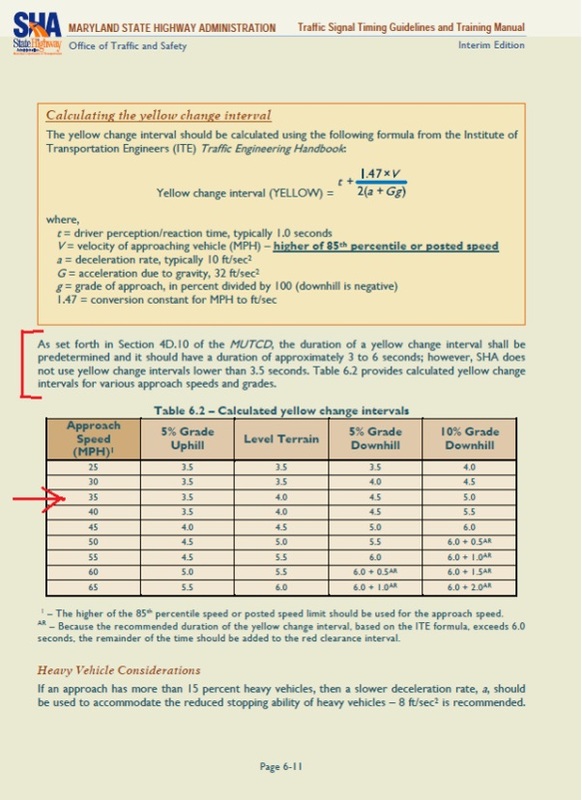 Yellow lights are supposed to be timed according to a formula based on traffic speed. For a 35mph road, the formula would normally give duration of 3.5s. However the Montgomery County DOT claims that it is acceptable to use a slower speed than the speed limit due to the fact that the light in question was a left turn signal. But even using the DOT's stated speed of 27mph, the computed speed based on the ITE formula is still greater than 3 seconds, and the DOT rounded the time down when configuring the yellow light. But more significantly, in May of 2015 the Maryland SHA increased the minimum yellow light time for all yellow lights to 3.5 seconds. The traffic light in question is located on a state highway. Montgomery County failed to increase the yellow light duration for the subsequent 18 months. Yellow light timing formulas are supposed to take into account the time for humans to perceive and respond to a the signal change and bring a vehicle to a complete stop. Yellow lights which are too short create a "dilemma zone" where some motorists can neither safely stop nor safely proceed. The Federal Highway Administration has stated "There is a correlation between the duration of the yellow interval and red light running events. Van der Horst observed a substantial reduction in the number of red-light running events after increasing the duration of the yellow interval from 3 to 4 seconds (in urban areas) and from 4 to 5 seconds (in rural areas). A small adjustment was observed in the drivers' stopping behavior, which was attributed to the relatively low increase in the duration of the yellow interval." Some jurisdictions in California which increased yellow light times saw violations drop over 75%. The Montgomery County Government has defended their right to issue red light camera citations just 0.1 second after a light turns red, making short reductions in yellow light times HIGHLY relevant to the number of potential violations. WJLA asked several Montgomery County agencies for comment, but no county representative would speak about the matter on camera. Montgomery County defended the timing of the light by email, claiming it is correctly and legally timed. The county decided to switch the camera off after the media started asking questions until the yellow light is increased to comply with the SHA standard, but no tickets have been refunded. While the county claims 3 seconds is the correct duration for a left turn signal, it turns out that the left turn signal on Seminary Road at Georgia Avenue, at the same intersection but perpendicular to this yellow light, is set to 4 seconds not 3. The red light camera only enforces the left turn from Georgia Avenue with a 3(ish) second yellow light, but not the left turn from Seminary road with a 4 second yellow. The Maryland Drivers Alliance has attempted to conduct our own investigation of the impact of this yellow light duration on red light camera violations. However Montgomery County denied a Maryland Public Information Act request for the yellow light times their system records for individual violations. When we requested that they instead provide the portion of the database containing these records, Montgomery County demanded fee of over $19,000 to let us see the records. We asked the SHA for a copy of their yellow light timing policy and were given a document dated in 2003 stating that the minimum time any yellow light should be set to is 3.5 seconds. We asked the SHA to explain why this was provided when we had asked for a policy Which Montgomery County told us was implemented in 2015 and the SHA responded: "Our policy states that a 3.5 second was established in 2003. If you have any further questions, please reach out to the County." Documents provided to us by the Montgomery County DOT shows that some traffic lights with only 3 second yellows had been set after 2003.